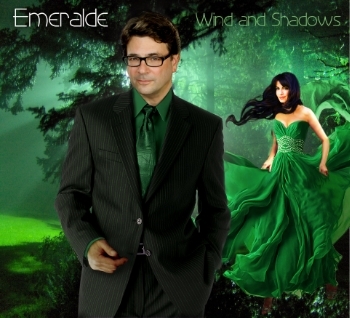 (LOS ANGELES, CA) — Music fans and critics alike are taking noticing of EMERALDEs debut album, Wind and Shadows  available now from Gasbarro Music. EMERALDE is comprised of songwriting duo MarcoGio (Mark Gasbarro) and Margie Russomanno, whose individual efforts have already reached millions of people worldwide. MarcoGio is best known as a sought after pianist, composer/arranger, producer and conductor, whose piano playing and/or orchestration has been featured on ABCs hit series Lost and a long list of Hollywood blockbusters including The Incredibles, Ratatouille, Cars 2, Star Trek, Star Trek Into Darkness, Super 8, Mission Impossible: Ghost Protocol and UP (which won an Academy Award for Best Musical Score). Margie Russomannos successful solo career includes song placements in major network television shows and feature films. With over 500,000 YouTube views, Margies most recent album, All I Need, spent three weeks at #1 on ReverbNation’s Los Angeles Christian/Gospel Chart where it remains in the Top 10. Together, MarcoGio and Margie have teamed up as EMERALDE to create a genre of music they call Dream Pop  filled with Margies lush vocals, MarcoGios deep grooves and a cinematic feel. A music video for EMERALDEs debut single, Spontaneous, can be viewed on the groups official website at www.emeralde.com. Their debut album, Wind and Shadows, is available now at Amazon, iTunes and wherever music is sold.